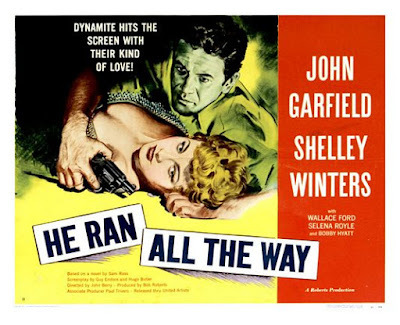 “He Ran All the Way” opens with the camera pressing in tight on the sweat-strewn face of Nick Robey (John Garfield) in the midst of a nightmare. This bad dream is a premonition of the plot to come, of course, but it also foreshadows how so much of John Berry’s rock hard noir takes place within the space of Nick’s troubled mind, which he struggles to prevent from racing, particularly when the emotional heat gets turned up, resulting in numerous rash decisions. Frequently played by Garfield with a nasty sneer, Nick comes across ruinously entitled, and yet when he seems on the verge of getting what he thinks should be coming to him, he still can’t settle down long enough to accept it. No, he maliciously pushes it all away, brought home in a closing shot so fatalistically remarkable that it might just bring you to your knees just as it brings Nick to his. As the movie opens, Nick is more or less pulled into a payroll robbery by Al (Norman Lloyd). It quickly goes wrong, however, and Al winds up dead, and Nick winds up killing a cop and going on the run. Blending it with the crowds, Nick finds himself pulled along to a public swimming pool, where he takes a dip to try and let the heat blow over, meeting Peg Dobbs (Shelley Winters) and falling for her, maybe, and her for him, kind of. She invites him to walk her home and then back up to her place. If this circumstance might arouse questions from the Plausibility Police, like why this woman might invite in and keep chatting up a guy who is so quick to boil, but his bursts of anger, tempered with bouts of actual kindness, make him seem more like a hard luck case than an armed fugitive, and Winters smartly plays straight to this throughout, like she can’t help but be drawn to that in spite of herself. Alas, at home, where she lives with her Mom (Selena Royle) and Pop (Wallace Ford) and young brother Tommy (Bobby Hyatt), paranoia ensconces Nick, and no matter how sweetly Peg treats him, the more he seems to think she and her family are out to get him, convinced they are conspiring with the cops. They are not, but that doesn’t matter. Nick draws his gun and takes them hostage, determined to lay low in their place as a dragnet spreads out across the city to try and find him. The dynamic instantly becomes tense, with Nick thrusting himself into the household’s central role, evoked in a shot where Nick stands at the center of the kitchen amidst everyone else, at first blithely sipping coffee but then flipping a switch and lashing out when he realizes they are all concealing information from him. As the dragnet tightens and the longer Nick stays inside, the more he seems to break from reality, and as he does, so does Peg, told by her father to stay away from this madman yet emotionally towed along in his wake anyway, only to have an indelible snapback in the final minutes when push comes to shove. Even Nick occasionally snap backs, never more effectively than a dinner table scene in which he, having prepared a turkey, like a member of the family he isn’t, wants everyone to eat and then forces everyone to eat when they won’t, determined to the point of nuttery to turn these family into the family he so desperately craves. Yet as Pop starts carving the turkey, Nick, as if momentarily coming to grips with the emptiness of his own desires, takes up a liquor bottle instead and walks out of the frame, sitting down by himself in the next room. Emotionally, it mirrors the wrenching closing shot, reminding him, and us, that his own worst impulses will always ensure that he is all alone.